The Currituck Club is going green! We would like to introduce our new Electric Trolleys! Hate being stuck in the weekend traffic on your way to Corolla? 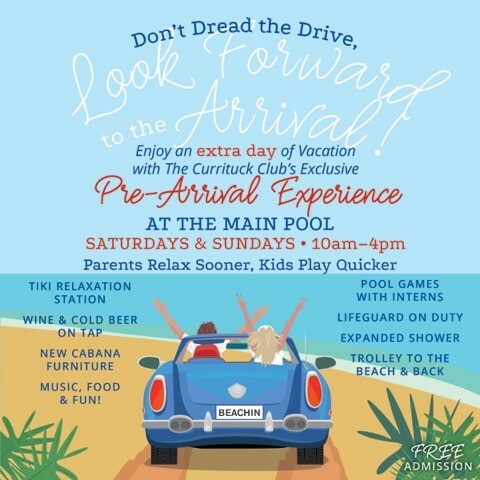 The Currituck Club's brand new "Pre-Arrival Experience" is all about starting your vacation early. Join us before your check-in on Saturdays or Sundays from 10 - 4 all summer long to get a jump on your vacation! Let the interns entertain the kids with pool games while you stretch from the drive and relax in the new cabana furniture with a cold beverage! Lifeguard on duty, music, food, wine and beer available. Get your wristbands and even grab a trolley to the beach. With the expanded shower, you and the littles can rinse off and take another dip in the pool while you wait for your house to be ready. A Currituck Club exclusive - we treat you right! 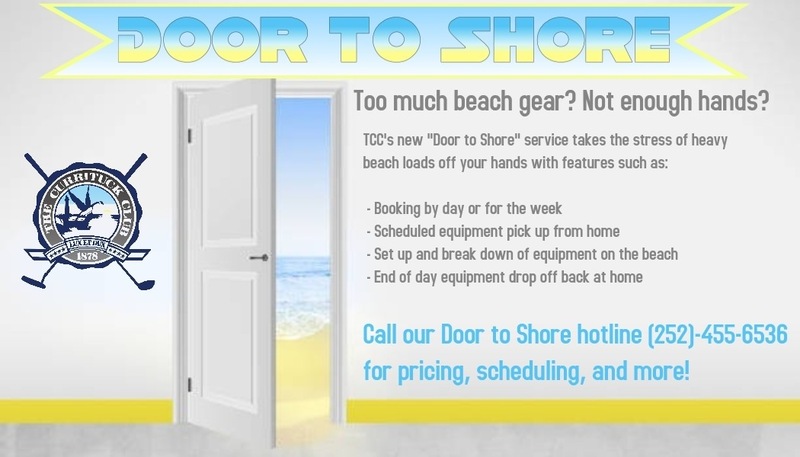 The Currituck Club's new "Door to Shore" service is all about taking the stress of large beach gear loads literally off of your back. Our team will pick up your beach gear directly from your house (by day or by week), set it up on the beach for you, and then break it down and bring it back to your home at the end of the day. Let us help you relax on your vacation. Contact our Door to Shore hotline (252-455-6536) or our Community Concierge (252-453-4011) for pricing, scheduling, and more information! For the Summer of 2018, your experience at The Currituck Club is going to be taken to new heights! We are excited to introduce our one-of-a-kind Summer Package series designed with YOU in mind. Whether a little more adventurous or you want the full VIP experience . . .check out the Summer Packages icon on the Home page for more details. You've asked for it and we've delivered! This summer we have Live Trolley Trackers accessed via our new mobile app for you to be able to see each trolley’s location in the community with real-time positioning! Now you will be able to get everyone ready and have the coolers and beach gear prepped for your journey to the beach for some summertime fun! When you are getting ready to leave the beach, check back with the Trolley Tracker to see how close the next trolley is to the beach access. You can access the Trolley Tracker by clicking here.